If you haven't heard of Marvel's Super Hero Squad before now, it's basically a kid-oriented, tongue-in-cheek, super-deformed version of the Marvel universe. 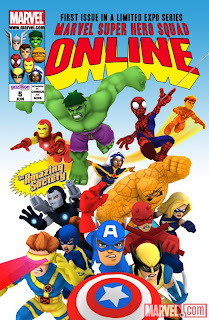 All your favorite heroes and villains are here in "Super Hero City", but without all the doom and gloom you might find in the pages of the Marvel Universe proper. Instead, everything here is bright, colorful, and (best of all of kids) fun. Even older comic fans can get a kick out of the series, as the characters parody their more grown-up counterparts in all kinds of goofy ways. 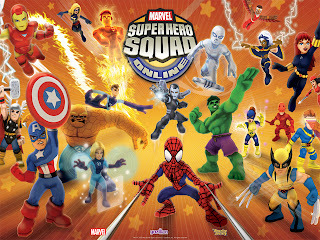 Apparently, it's a formula for success too, as the Super Hero Squad franchise has been developed into a hit toy line, television series, comic books, and a handful of console games to boot. Although Marvel Super Hero Squad Online is being touted as an MMO game, it doesn't really fit into the traditional mold of an MMO. You're never going to pull together all the forces of the Marvel Universe in epic 50-man raids, or call in your guild mates for a multi-hour instance. Instead, MSHSO is more like a casual sort of getaway to have fun in shorter bursts. In a lot of ways, it reminds me of Sony Online Entertainment's free-to-play game, Free Realms. Both titles are essentially set up as large hubs to interact with other players while competing in a variety of small missions or minigames. While Free Realms currently has more meat on its bones in terms of content, it's also had a two year head start on MSHSO ... and it doesn't have the Marvel Comics stable of characters at its disposal either. After signing up for a free account, newcomers to MSHSO will work their way through the obligatory tutorial sections, which teach the basics of the game's mechanics and how to navigate the menus. 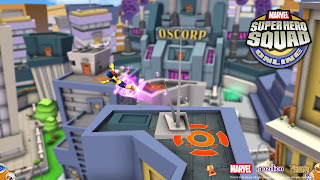 After going through the motions, the player is give an initial squad of four characters: Cyclops, Ms. Marvel, Falcon, and The Thing. Players can switch out on the fly, earning experience, coins, and tickets for completing Missions and winning Card Games against different opponents. There are also a few Arcade games that players can compete in to earn some more loot. XP will help level up whichever active character you're currently using, coins (gold and silver) are used to purchase new goodies from the shop, and tickets are used for a large prize wheel to earn more cards, items, or (most likely) coins. The bulk of your time in MSHSO will likely take place outside of the main hub in either Missions or Card Games. Missions are action-based beat 'em up battles which pit heroes against a slew of bad guys trying to pull off whatever happens to be the scheme du jour. Players click on whatever henchmen they come across, picking up the occasional power-up along the way, while avoiding incoming enemy attacks. Missions are usually broken up into three stages, with the final stage culminating in a boss fight against one of the mainstay supervillains of the Marvel Universe (such as Sabretooth, Mystique, or Doctor Octopus). Players earn medals based on their performance in each mission, with higher medals earning more XP, coins, and tickets. Missions can be played solo or, if you feel like doing a comic-style team-up, with up to three additional heroes. As fun as the Missions may be, my personal favorite part of MSHSO is the Card Game. Maybe it's got something to do with all that time I spent in comic shops playing collectible card games, but there's something about spending time tweaking out a deck of cards and going mano a mano with another player to see who's built around the better strategy. The game here is pretty simple to learn, with the ultimate goal being to whittle away the other player's cards, knocking him out of action. There are card game missions which can tweak the initial setup of matches, with some opponents starting with larger or smaller decks or with certain cards already in play. It's fun to see the animations whenever a card is put into play, as you get to see the characters on the card in play execute their attack against your opponent. And whenever you get tired of playing against the computer, you can always pit your deck building skills against other players logged into MSHSO. 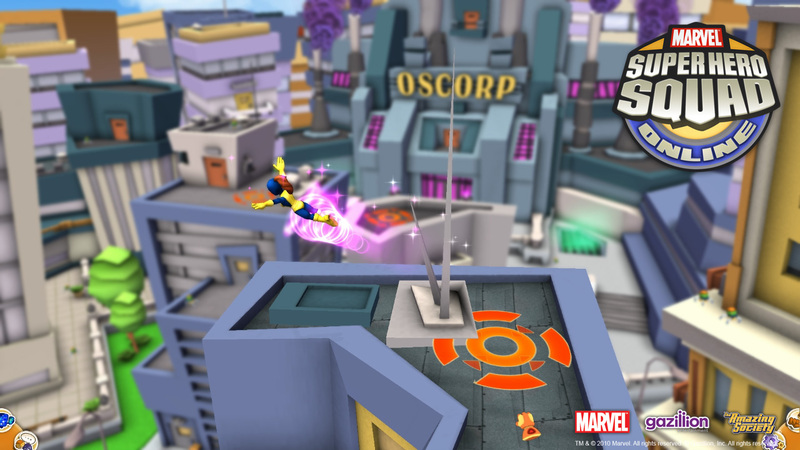 Where the Marvel Super Hero Squad starts to falter is in its relatively light amount of actual free-to-play content. I understand the desire to generate revenue for the game, and the desire to leave gamers wanting more ... but this is barely even an appetizer. For example, you'd better like the four initial characters available, because it's going to me a long time before you earn enough coins to buy anyone new. This is compounded by the fact that most of the game's extras (including extra Missions, cards, and characters) have to be purchased with the extremely hard to get gold coins vs. more easily obtained silver coins. Plus, certain characters are only accessible to players who maintain a "Jr. Shield Agent" subscription. You might buy a character as an Agent during a trial period, investing a lot of time and effort into building up his XP, only to have that same character vanish from your lineup if you let your subscription lapse. I've never been a big fan of this business model, as you have already paid for a specific item (in this case, a Marvel character) once ... but then keep paying for the right to keep using it in the game. Hopefully, in time, Gazillion and The Amazing Society will see fit to bulk up on the amount of free-to-play content, and not penalize players who have tried out the subscription features. All that being said, Marvel Super Hero Squad Online is still a fun experience for young comic book fans (and those that are just young at heart). It's a simple but addictive experience that's definitely worth checking out at least once. Just be ready to shell out a little extra dough if you expect to get the most out of the game.